By all that is rational, sane-minded and incontrovertible, the Seventh symphony of Beethoven should overflow concert halls, the only symphony for which concert-goers should pawn both grandmothers and spaniels to get a ticket. Of the other major symphonies, the Third is stolid, the Fifth foretells the horror of the future, and the Metholist-Lutheran hymn tune of the Ninth should drive any save 18th Century ministers to distraction. The Seventh, though, whether under the heaven-sent baton of a Karajan or the most human leadership of last night’s Jirí Bĕlohlávek has everything to make audiences happy, at least in three movements. The opposite of Beethoven’s famed visage, the work smiles and laughs, the moods range from the exuberant to the sanguine. The tempos might be balletic to a choreographer, but this is hardly a “dance symphony”: It is the music of human excitement and humane joy. Listening to the Mostly Mozart Festival Orchestra last night, the symphony spoke for itself. Bĕlohlávek, presently the leader of the BBC Symphony, is hardly an idiosyncratic conductor, and he never exaggerated the bouncy vitality of the piece. The crescendos reeked of Rossini, the rhythms had a kind of Berlioz disjointedness, but one never lost sight (or hearing) of the fullness of the work. For this, one must credit this fine summer orchestra. The dimensions are right, (less than 50 percent of the NY Phil) The players—especially that absolutely faultless horn section—are engaging, and it takes on new personalities with all its conductors. All of this was most evident in the finale. Beethoven specified Allegro con brio, which to some conductors means scurrying at Olympian speeds. Bĕlohlávek hardly lagged, but we heard each instrument, even the most rapid playing. Beethoven wrote for two horns, trumpets and winds, not the doubling in the full orchestra. But now we come to the one enigma of the Seventh Symphony. For in between the three joyous movements is the most tragic funeral march ever written by Beethoven This is not marked grave or largo,but a cheery Allegretto. And when taken at that tempo by Bĕlohlávek, the funeral procession—for what else could it be?—ranges from the moribund to the odd to the march-like to a chord which can never be explained. All of it in the same key!! (Give or take a few major-minor changes). Outside of that movement, the concert was a salute to joy, beginning with Bohuslav Martinu’s Second Serenade. It is no shame to say that I had never heard it before. Like Villa-Lobos and Teleman, Martinu wrote endless music, some of which shouldn’t be heard at all. But this Serenade was delightful. No cellos or basses to bring down the string section, simply some lovely treble tunes, ending with a rustic Czech square-dance. The eight minutes could have been repeated, and nobody in the audience would have objected. 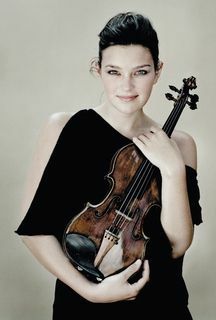 The centerpiece was Mozart’s endlessly sunny, ravishingly beautiful Sinfonia Concertante, played by the still-young Janine Jansen and Ukranian soloist Maxim Rysanov. Like their conductor, they allowed the music to speak for itself. Conductor Bĕlohlávek was almost leisurely at the beginning, but so subtly did he increase the tempos that by the time our soloists entered, the audience had been virtually beckoned into following them. Ms. Jansen played with a clear spare tone, but her poetry broke out at the right moments during the songful first movement and the middle of that soulful Andante. Mr. Rysanov was never overshadowed (Mozart probably wrote this for himself), and when the two followed each other in the short cadernzas, one felt the understated radiance which underlined the entire evening.